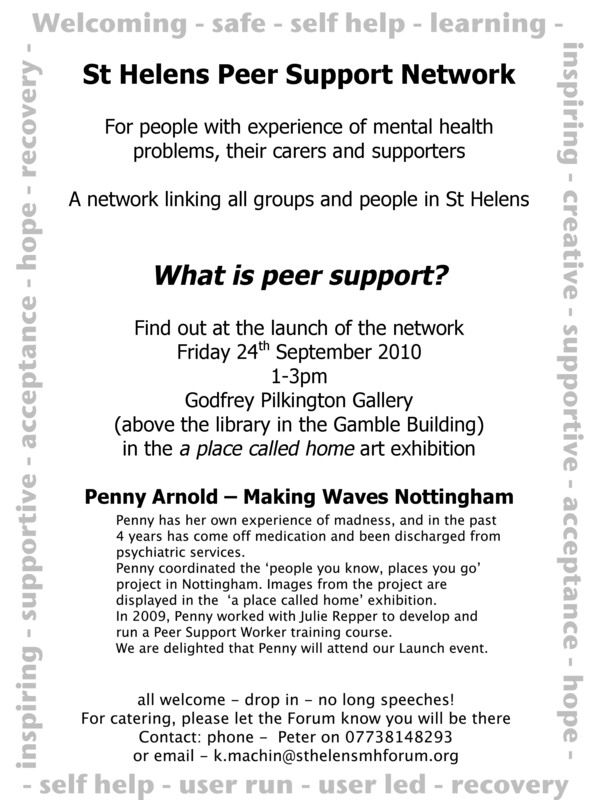 Thank you to everyone who attended the launch meeting of the Peer Support Network. It was great to see so much support for the idea. The only difficulty we have is the day. With so many local self help groups, its always going to be difficult to decide which day to hold any new meeting on – we’ll always clash with something. Some people suggested we held meetings on different days each week or month. Others said we need to stick to one day of the week so that people get to know when it’s on. Everyone in the room proposed a day when it wasn’t their group meeting! One idea was that each group should be sending a representative and they would feed back to other group members. The rep could change each week so that any one person would be able to keep up with both their self help group and the network. And then there was also a discussion about how often to meet – weekly, fortnightly or momthly? After that we’ll see how it goes and what people want to do. Mike Smith has 26 years of international experience in mental health. He was the Director of Nursing in Birmingham before becoming a freelance trainer and consultant. He has been a champion of recovery and has a special interest in the areas of self harm and voice hearing. THRIVE approach to mental wellness, which he developed with Marion Aslan: THRIVE stands for time, healing, resilience, independence, vivacity and emancipation. This doesn’t rely on the medical model and includes the concept of getting through difficulties without medication. Diagnoses / labels: Aspergers seems to be replacing schizophrenia as a common diagnosis or label in the USA. Mike had organised events in separate years, and whereas originally he noted many people who had been told they had schizophrenia, nowadays he has noticed a higher proportion with aspergers. Also Churchill’s black dog: There is evidence that he heard it and spoke to it. How would this be labeled nowadays? Would he be given a diagnosis of schizophrenia? Personality disorder can be an arbitrary label. Tourette’s as well. There is a lot of misunderstanding around these labels, but some people find them helpful. Emphasis on back to work: While occupation is important for wellbeing, there is a difference between a job and volunteering. A job needs 100% attendance and can put pressures on people. People need to choose how to occupy themselves and be offered alternatives. People are financially better off in work, but not all jobs are good for mental health. But it can be very difficult to come off benefits. America: He does a lot of training there and visits regularly. The situation there is very different. With consumerism, some people have more choice, they are listened to and can choose staff. Insurance or the state pay for the service, which can be very dependent on medication. There are many young children on anti-depressants. Medication is advertised on TV. There is a history of recovery work in the UK that doesn’t involve medication. The York Retreat was founded in 1792. Mike has regular meetings in Manchester which people are welcome to attend. He also does work in Africa, with widows and young people and has developed a charity to support them. Helping people is something that is good for people’s own sense of wellbeing. He is encouraging people with mental health problems to support the charity to help other people and also to help themselves. More information is available on his website.